We bought new furniture. For the humans in the house? Of course not! We bought it for the kitties! Blackie could care less. But we have noticed the astonishing phenomenon that if we have plenty of things to scratch on, of the appropriate material (of course) the kittens scratch the furniture less. The kitten’s favorite thing to scratch on is anything with jute or sisal. Carpet, not so much. So we ordered a tube about two and a half feet tall. Part of the outside is covered with sisal. Here is Lumos kindly modeling it for me and my camera. Isn’t he cute? I have it sitting sideways so the sisal side is given maximum exposure. So far only Nox has given it some good scratches. Lumos prefers the jute wrapped scratching post over by the couch. Or the couch. The poor old couch needs to be replaced for the humans in the house, but not until the scratching gets more under control. Finding the preferred material helped a whole bunch. 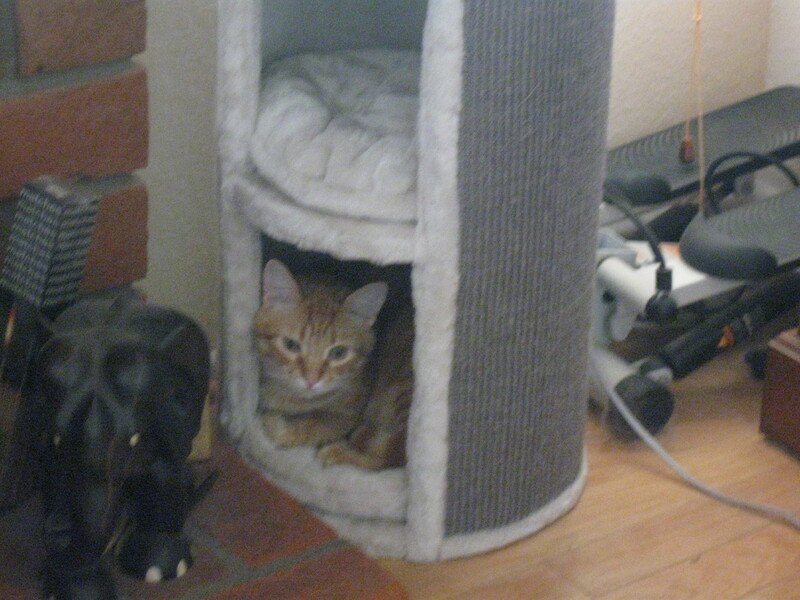 The new tube might be considered the kitten’s birthday present. More on that in a couple of weeks! Yes, Lumos does look cute in his pose for you inside the tube.